(1861-1933) was born in Norwich, Connecticut in 1861. He first became interested in art in Minnesota, where the family moved when his father became rector of an Episcopal Church there. As a young man, Walden moved to Paris where he studied painting with Carolus-Duran. 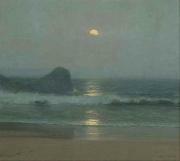 In around 1893-97, Walden was in England, living in Falmouth. Paintings of Cardiff in Wales are in museums in Cardiff and Paris. Walden received medals from the Paris Salon and was made a Knight of the French Legion of Honor. He visited to Hawaii in 1911 and several times thereafter. Walden died in Chantilly, France in 1933. According to David H. Forbes, author of Encounters with Paradise: Views of Hawaii and its People, 1778-1941, Lionel Walden "was the finest seascape painter to work in Hawaii". 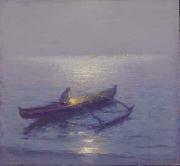 The Brooklyn Museum, the Henry Art Gallery (University of Washington, Seattle), the Honolulu Academy of Arts, the Isaacs Art Center (Waimea, Hawaii), and the Musee d'Orsay are among the public collections holding works by Lionel Walden.